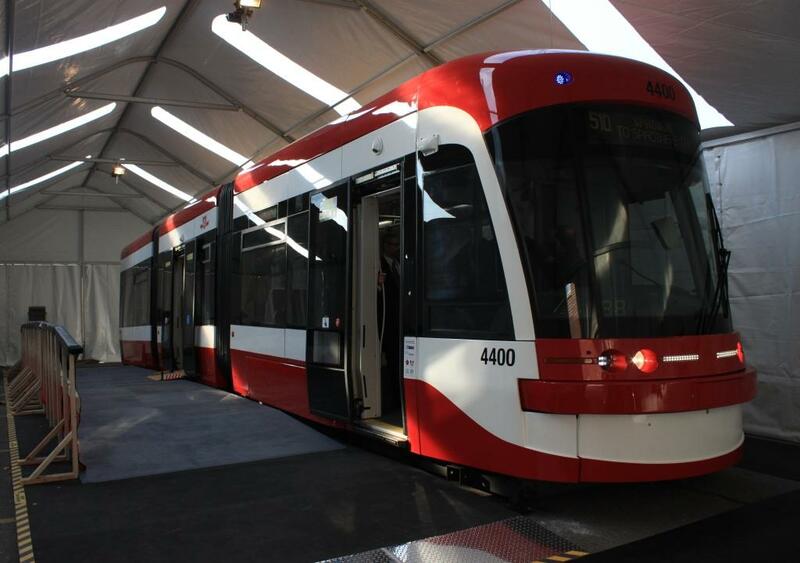 I exchanged emails with the TTC’s Stephen Lam, Chief Engineer, Rail Vehicle Engineering on some the technical subjects readers have raised about the new cars. The sections below are based on his responses. Yes, the weight-per-axle is greater on the new cars than those we now operate. The new cars, like the ALRVs, have three two-axle trucks, but these carry longer, heavier cars. The axle load is higher on the new low floor cars than that on the ALRV because it is a longer car with higher capacity, air-conditioned, more auxiliary equipment, with structure and metal still built for 30-year life, but on the same number of axles. The axle loads on the CLRV and ALRV are almost identical because the ALRV is approximately 1.5 times longer than the CLRV, with 1.5 times more axles to carry the additional 50% weight. What really matters, however, is the “unsprung load”, the portion of the total load that is not supported through some form of resilient suspension. Vibration that could cause track and equipment degradation, however, is more caused by the mass below the suspension system – in other words, the weight on the wheel-axle set, or what is known as “unsprung” mass. The new low floor vehicle still employs three layers of suspension – super-resilient wheels with soft rubber blocks between the wheel tyre and the axle; a rubber primary suspension system; and a coil spring secondary suspension system that supports the carbody. More importantly, the “un-sprung” mass on wheel axle set of the new vehicle is lower than that on the current fleet of vehicles by approximately 10%. Vibration problems with the roadbed arise from a number of sources, and this was described in detail in a research paper prepared in response to early problems with the CLRV fleet. The original “Bochum” wheels on those cars have a rubber layer to damp vibrations, but it is a completely different configuration from what existed on the PCC fleet and a similar arrangement with the super-resilient “SAB” wheels now used. On the Bochum wheel, the axle hub is separated from the steel tire (the ring of metal that actually runs on the track) by a rubber ring. This ring is placed in compression by the force of the wheel on the track, and so the wheel is stiff in that direction. This aids in transmission of vibration to the trackbed. The concrete slab acted as a resonator. When these wheels were introduced, Toronto was building non-resilient track with rails laid directly in concrete. By contrast, older tracks sat in asphalt or paving setts and the roadway would not vibrate. The SAB (and PCC) wheels also have rubber between the hub and the tire, but in a vertical sandwich. On the PCC wheel, it is a single piece of rubber on each side while on the SAB wheel there are 16 separate “hockey pucks” (8 on each side of a wheel) providing a similar, but greater effect than the PCC design. This puts the rubber in shear vertically, the direction the wheel bears on the track. It also changes the vibrating frequency to one that is high enough that solid pavement cannot resonate. Moreover, for many years the TTC has been building track that is mechanically isolated from the slab with a rubber sleeve so that any vibration from the wheels is damped out. The new LFLRVs have skirts that cover much of the truck and block the transmission of noise from the wheels into the air. 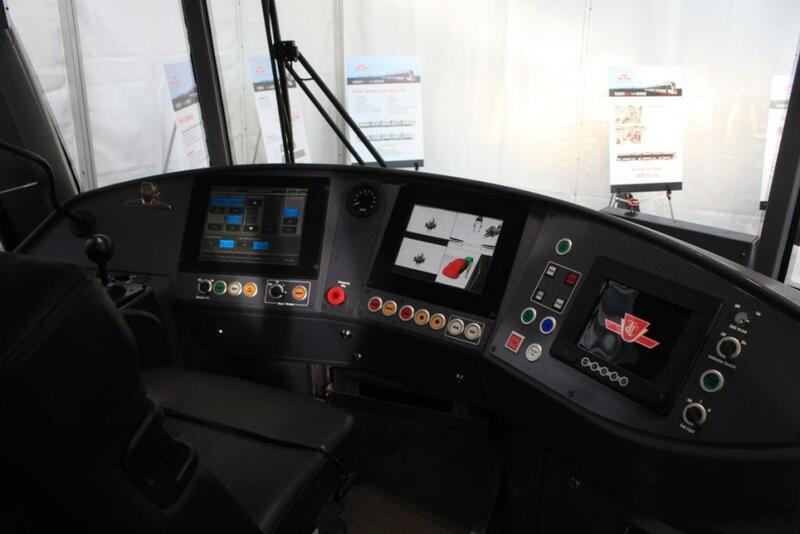 Unlike the switches found on many LRT systems, the TTC’s streetcar network is built in the North American standard layout using single-point switches. This means that there is a movable blade only on the “inside” rail of a curve. By contrast, railways and the subway use double-point switches where both rails have a movable blade. A single-point switch is cheaper to build and maintain, especially for street trackage, because there is no need to link the two blades so that they move as one unit. That’s why it was so common on streetcar systems. When a streetcar enters a switch that is in the curved or “open” position, the wheel on the inside of the curve (the right side of the car on a right turn) is pulled into the turn, and through the axle this directs the wheel on the outside into the correct track. When the CLRVs operated with Bochum wheels, this arrangement caused derailments because the Bochum wheel, with its rubber ring, is not stiff horizontally. Rather than turning into a curve, the wheel would deform. Because the inner wheel was not pulling its mate on the other side of the car into the curve, the outer wheel would follow the straight track. The SAB wheel is stiff horizontally and this pushes the inner wheel into the curve as desired with a corresponding move in the outer wheel. One concern the TTC had with low floor car designs that used split axles (a separate half-axle for the wheel on each side of the car) is that there was no mechanism to transfer the force between inner and outer wheels at switches. Truck design also affects how well a car will follow track on a curve, but that is independent of the type of switch used. The specification for the new cars improves on the CLRV truck in this regard. Stephen Lam provided a set of illustrations of the design illustrating some of the points discussed here. Page 2 shows the design used for the Bochum wheel (left) and for the super-resilient wheel. Pages 3 and 4 show details of the suspension system. Page 5 shows the full truck (bogie) and skirting. This shows the second doorway of the car (also the second section) looking from the rear. The accessibility ramp is deployed at the high platform level. During the media briefing, we did not see it extended to its full length for pavement level access, but I was told that it is roughly three times longer for that type of situation. The brick pattern in the window is a reflection from a nearby building. It is not part of the colour scheme. 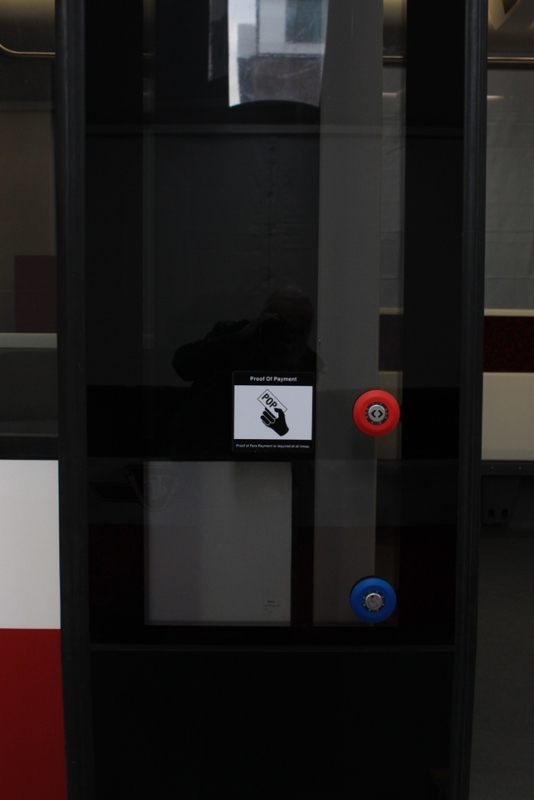 This is the rear half of the second door panel showing the pushbuttons for opening the door (red) and requesting ramp deployment (blue). All doors on these cars are passenger activated. This is a view toward the same set of doors from inside of the car. 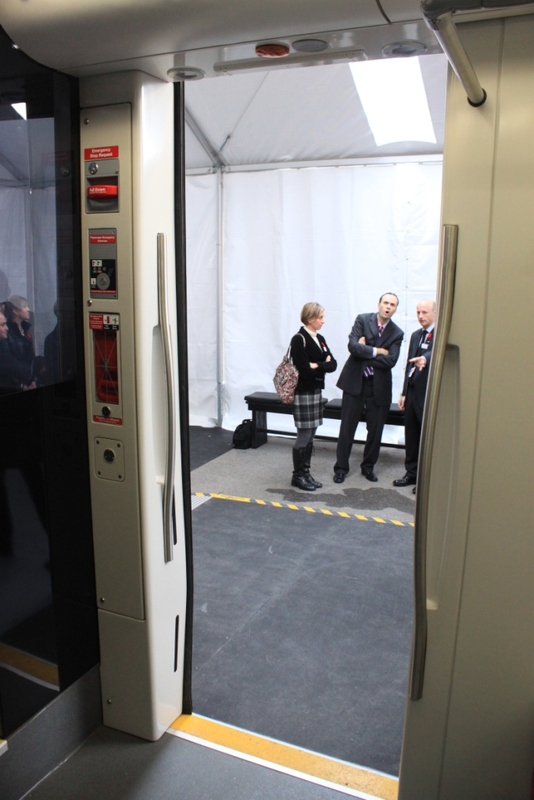 Note that the door panels are not all of the way open because they were set up manually for the tour. Also visible here is a sample of the extra wide seat. This is the view directly across the car from the second door. There are five flip-up seats in an area that can otherwise be used for wheelchairs and scooters. The lighter patches on the floor mark where spots for these devices and there are stop request buttons on the wall beside each of them. The red box showing partly in frame (see enlarged version) on the left side is a placeholder for the ticket/Presto machine. Looking out through the front door which is single width. TTC Chair Karen Stintz is in the background. 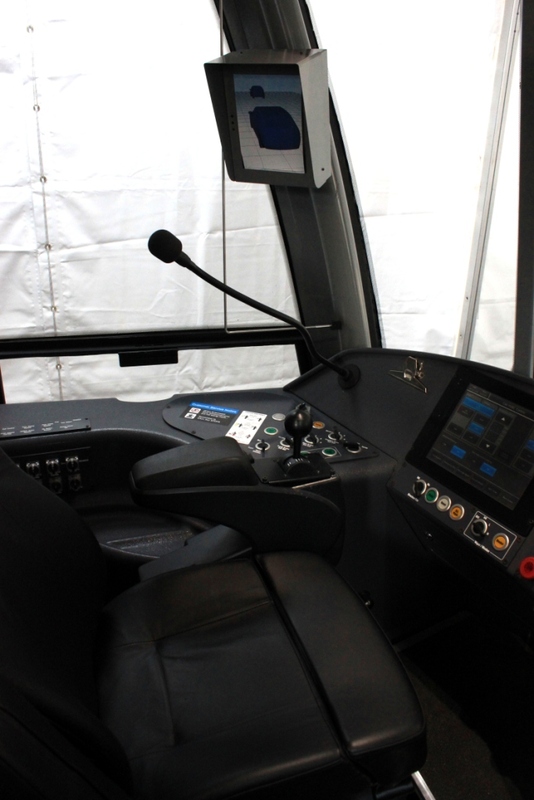 The main part of the operator’s cab. The video display in the middle will contain images from the cameras at each of the four door locations. The left side of the operator’s cab showing the control handle for the car. 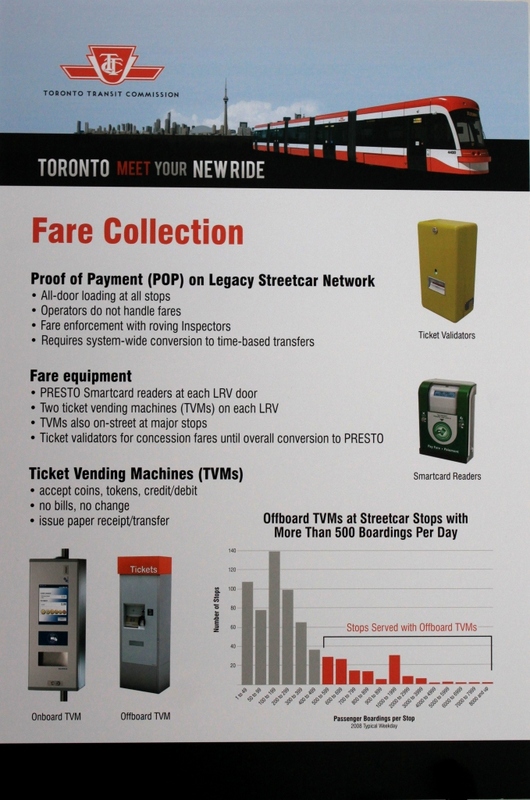 A poster explaining how fare collection will work. Both a generic ticket vending machine and Presto are shown. The text in the poster says that the new scheme requires a system-wide conversion to time based transfers. 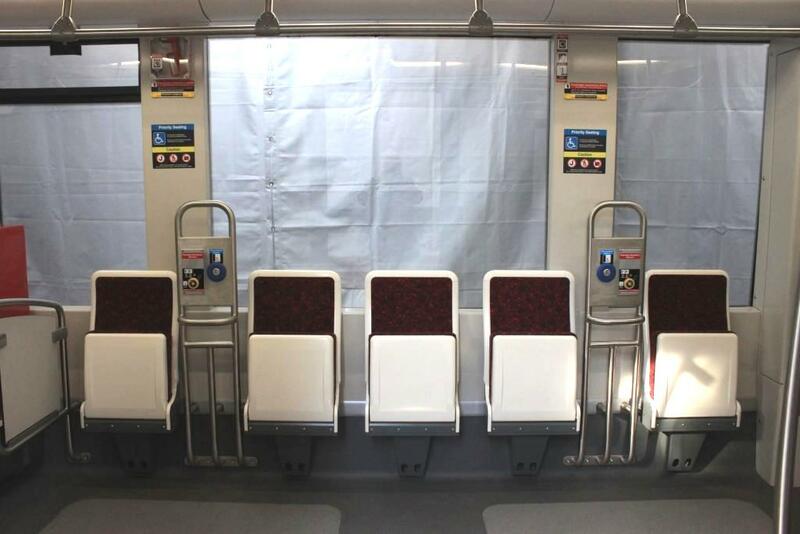 This appears to set the stage for new transfer rules on the TTC. A poster comparing vehicle capacity. The values shown are Service Planning averages, not the crush capacity of the vehicles. Also, the size of the new fleet is still shown as 204 despite budget moves to reduce or defer part of the order. This map shows the deployment plan for streetcars on each route, and it is much different from the scheme laid out in last year’s budget papers. Bathurst, Harbourfront and Spadina are first up in 2014 with Queen following in 2015. This will allow the ALRVs to be retired in roughly 2016. I’m still confused. The numbers I had quoted earlier (from transit.toronto.on.ca) are labeled as “Normal service usage”, not crush capacity. I had specifically avoided quoting crush capacity numbers from the reasons you’ve mentioned before. 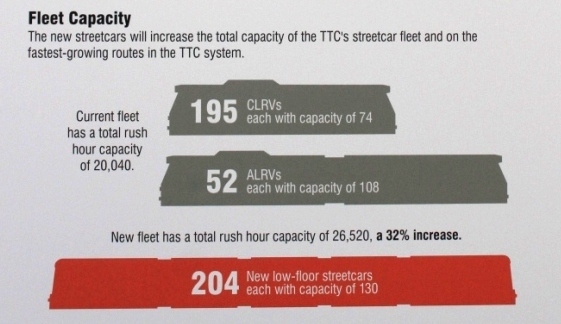 Why are the service capacities quoted by Transit Toronto and National Post different than the numbers shown on the poster at the official mockup? Steve: The ones at the mockup are on posters actually produced by Service Planning, and they match the figures given in the Service Standards. I don’t think it is physically possible to get 132 people on a CLRV. A few times I have counted people getting off a packed car at Spadina Station, and that doesn’t even break 100. As for 251 on an LFLRV, that is a fantasy number from Bombardier, I think. Bombardier’s 251 isn’t exactly a fantasy figure, it’s based on the calculations they do in Europe which could be based on 4, 6 or 8 persons per square metre according to the circumstances. Theoretically (at 8 ppsm) a 30 metre LFLRV can carry 300 passengers but, as you say, that could not be sustained. The number of doors has a lot of influence on the practical figure. 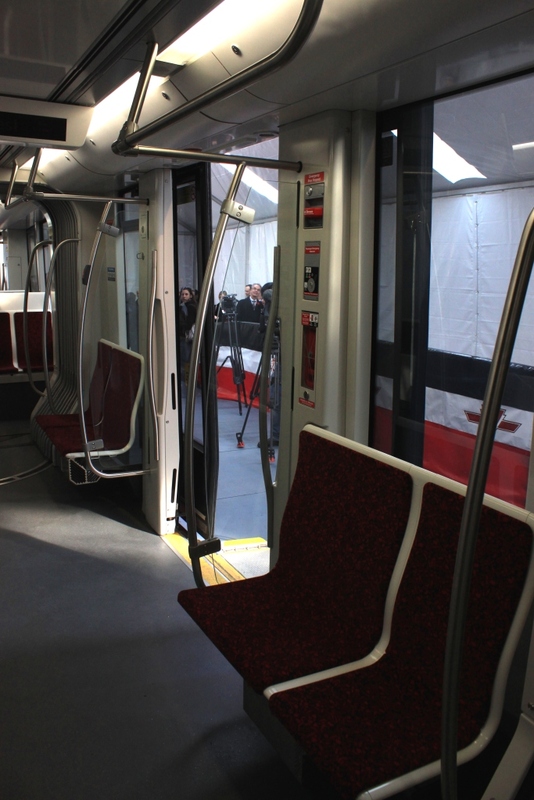 If there are few doors, passengers will stay within range of a door and not spread out through the streetcar. If there are lots of doors the passengers will distribute more evenly as they don’t have to worry about getting to a door quickly, so the vehicle will carry more. Your Bombardier I see has only 2 double doors and 2 single doors, seemingly limited to this by the configuration of the trucks and articulations. If you look at the same-length Skoda 15T for example you will see that it has 6 doors and the trucks are under the articulations so its practical carrying capacity is far greater. 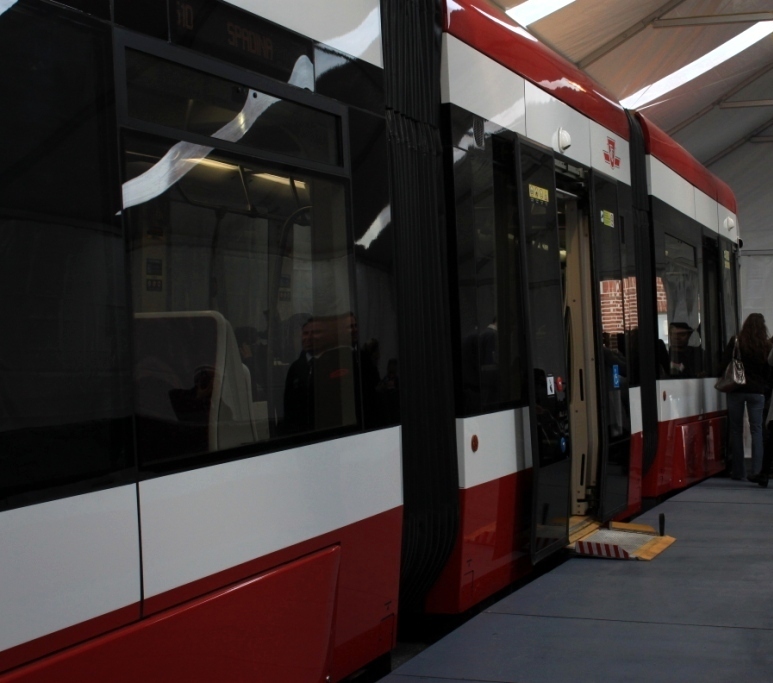 As well as the cornering issue, this may be another issue on which TTC has disadvantaged itself by buying the Bombardier rather than the Skoda-Inekon design which, I note, has been able to fit in 4 double doors and 2 single doors. Has there ever been a transit system which tried accessible ticket-issuing fare-gates at every door on streetcars? Would such a thing be possible or feasible? Steve: Gates? The whole idea of self-service fare collection is to move people quickly, not to slow everyone down to a crawl behind the person whose pass isn’t working today. If I’m not mistaken, the overhead wiring along Richmond Street has been converted to pantograph-friendly wiring, even for the wrong-direction half-paved-over track just east of Yonge Street. Are there plans to preserve both pairs of tracks along Richmond and Adelaide? Steve: No. The “wrong way” track has been removed in several locations including at some intersections. The overhead crew is probably just blindly converting whatever they encounter. That seems like a waste of time and resources. I wonder why they don’t just remove these wires then. Steve: Probably because nobody ever thought to tell them to do this. At first I thought the double doors would open all the way to allow for faster passenger flow, but then I saw your photos which shows the accessible doors open only to the width of the ramp. Having the doors fully open would mean wheelchair users might use a part of the doorway that doesn’t have ramp coverage, and risk falling off as a result. Does anyone know if the double doors open all the way in general, or just to the width of the ramp? Steve: Oh dear … nothing like having one of your extra wide doors not operate at its full capacity. We should have a real live car here quite soon to check this out.